Jules Bianchi is the most recent driver to have been fatally injured during a Grand Prix. He died in July 2015, nine months after sustaining severe head injuries during the 2014 Japanese Grand Prix. 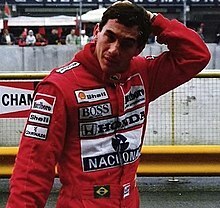 Three-time world champion Ayrton Senna suffered a fatal crash at Imola in 1994. This list of Formula One fatalities includes drivers who have died during a FIA World Championship race weekend, and those who have died while driving modern or vintage Formula One cars outside the World Championship. Track marshals and other race attendees who have died as a result of these accidents are not included in the list. Fifty-two drivers have died from incidents that occurred at a FIA World Championship event or while driving a Formula One car at another event, with Cameron Earl being the first in 1952. Thirty-two of the drivers died from incidents during Grand Prix race weekends which formed part of the World Championship, seven during test sessions and twelve during non-championship Formula One events. The Indianapolis Motor Speedway has seen the most fatalities; seven drivers have died there during the time that the Indianapolis 500 formed part of the world championship. Fifteen drivers died in the 1950s; fourteen in the 1960s; twelve in the 1970s; four in the 1980s and two in the 1990s. Following the deaths of Roland Ratzenberger and Ayrton Senna at Imola on consecutive days in 1994, there were no driver fatalities caused during world championship events for more than 20 years until Jules Bianchi's death in 2015, from injuries sustained during the 2014 Japanese Grand Prix, although three drivers died in the intervening years while driving former Formula One cars (two from the 1960s, one from the 1990s) in vintage racing and other events not associated with World Championship Grands Prix. Two Formula One Champions have died while racing or practising in Formula One, Jochen Rindt in 1970, and Senna in 1994. Rindt is the only driver to have won the championship posthumously. Indicates a race or test drive that was not part of the Formula One World Championship. ^ a b c d e From 1950 to 1960, the Indianapolis 500 was part of the World Drivers' Championship. ^ Ayulo died on May 17, 1955, the day after his accident. ^ Lewis-Evans died of burns on October 25, 1958, six days after his accident. ^ Unser Jr. died of burns on May 17, 1959, fifteen days after his accident. ^ Bristow and Stacey died in separate accidents. ^ Unable to slow down his car because of technical failure, Cabianca drove through an open gate onto an adjoining public road where he hit several vehicles. Cabianca was killed along with three other people. ^ Having collided with Jim Clark, von Trips's car shot up the bank lining the track, hit a wire fence and struck several people gathered behind it while spinning in the air. Von Trips, who was ejected from the car, and fifteen spectators died. ^ Godin de Beaufort died on August 2, 1964, the day after his accident. ^ Taylor died of fifty per cent burns on September 8, 1966, thirty-two days after his accident. ^ Bandini died on May 10, 1967, three days after his accident. ^ After a tire had blown out, Donohue careened through a number of catch fences and billboards, a support post of which may have struck his helmet. He and Manfred Schaller, a track marshal who had been hit by debris, died on August 19, 1975, two days after the accident. ^ Pryce and Frederick Jansen van Vuuren, a teenage volunteer safety marshal, were killed after colliding at high speed when Jansen van Vuuren was crossing the track to put out a fire. ^ Experiencing a mechanical failure on his car, McGuire lost control and crashed into a marshals' post. He was killed along with track marshal John Thorpe. ^ Peterson died in hospital on September 11, 1978, the day after his accident, as a result of fat embolism. ^ De Angelis died on May 15, 1986, the day after his accident. ^ Dawson-Damer crashed into a wooden gantry at the finish line, also killing Andrew Carpenter, a marshal, and seriously wounding another. The 59-year-old driver may have suffered a fatal heart attack before losing control of his car. ^ Bianchi remained comatose in hospital until he succumbed to his injuries on July 17, 2015, more than nine months after his accident. ^ Ferrer died on September 7, 2017, five days after his accident. ^ a b c DiZinno, Tony (July 17, 2015). "Jules Bianchi dies at age 25, his family confirms". NBC Sports. Archived from the original on 2015-09-06. ^ a b Savill, Richard (June 26, 2000). "Brother of Earl dies in Goodwood hill climb". The Daily Telegraph. London. Archived from the original on 2016-03-14. ^ a b "Grave incident mars Czech Superprix". Motorsport.com. July 16, 2002. Archived from the original on 2018-10-21. ^ a b "Historic racer Denis Welch dies in Silverstone Classic accident". Autosport. July 28, 2014. Archived from the original on 2018-10-21. ^ a b Benson, Andrew (March 13, 2012). "Formula 1's greatest drivers. Number 20: Jochen Rindt". BBC Sport. Archived from the original on 2016-08-26. ^ "Killed while testing racing car". The Times. London. June 19, 1952. p. 4. ^ "F1: A brief history of the US Grand Prix". F1.com. Archived from the original on 2018-10-21 – via Racing News. ^ a b c d e f g h i j k l m n o p q r s Williamson, Martin. "Deaths in Formula One". ESPN UK. Archived from the original on 2015-04-07. ^ "Charles de Tornaco". ESPN UK. Archived from the original on 2015-12-25. ^ "XVI Grand Prix de Pau". Motor Sport. Vol. XXXI no. 5. Teesdale Publishing. May 1955. pp. 264–265. ^ "Crash injuries fatal to Indianapolis racer". The Pittsburgh Press. United Press. May 17, 1955. ^ Diepraam, Mattijs; Muelas, Felix (2001). "The dashing Milanese that stayed young forever". 8W. Archived from the original on 2012-10-15 – via Forix.com/8w. ^ "Silverstone '58 – Hawthorn & Collins' all-English affair". Formula1.com. July 6, 2010. Archived from the original on 2013-10-29. ^ "Racing driver dies after crash". The Times. London. June 2, 1961. p. 23. ^ a b "Four die in Italian race car crash". The Times. London. June 16, 1961. p. 13. ^ Collantine, Keith (September 10, 2011). "50 years ago today: F1's worst tragedy at Monza". RaceFans. Archived from the original on 2015-10-27. ^ Williams, Richard (September 5, 2011). "When motor racing really was a matter of life and death". TheGuardian.com. Archived from the original on 2013-10-30. ^ "Ricardo Rodríguez". ESPN UK. Archived from the original on 2015-12-26. ^ Diepraam, Mattijs (May 24, 2000). "The last knight of Grand Prix racing". 8W. Archived from the original on 2016-03-07 – via Forix.com/8w. ^ a b "John Taylor". ESPN UK. Archived from the original on 2015-12-22. ^ a b "Lorenzo Bandini". ESPN UK. Archived from the original on 2016-05-02. ^ "Bob Anderson". ESPN UK. Archived from the original on 2015-12-25. ^ "Schlesser dies in experimental Honda at Rouen". ESPN UK. Archived from the original on 2018-02-15. ^ "Racing car death". The Times. London. May 26, 1970. p. 2. ^ "Martin Brain". Motorsport Memorial. Retrieved 2011-12-14. ^ Edworthy, Sarah (July 19, 2003). "Piers Courage lived life to the full and was tipped for GP greatness". The Daily Telegraph. London. Archived from the original on 2012-09-10. ^ "Jo Siffert". ESPN UK. Archived from the original on 2015-12-24. ^ "François Cevert". ESPN UK. Archived from the original on 2015-07-15. ^ "Peter Revson". ESPN UK. Archived from the original on 2016-05-12. ^ Katz, Michael (October 7, 1974). "Driver is killed as Fittipaldi wins title at Watkins Glen". The New York Times. p. 45. Archived from the original on 2018-07-23. ^ "Donohue dies after surgery". Eugene Register-Guard. Associated Press. August 20, 1975. ^ a b "Plaque to commemorate F1 winner". BBC News Online. June 11, 2009. Archived from the original on 2012-10-19. ^ a b "News in brief: Brands Hatch crash kills 2". The Times. London. August 30, 1977. p. 1. ^ "Ronnie Peterson". ESPN UK. Archived from the original on 2015-07-22. ^ "F1's greatest drivers – 19 Ronnie Peterson". Autosport. Archived from the original on 2012-12-09. ^ "Patrick Depailler". ESPN UK. Archived from the original on 2015-07-15. ^ Benson, Andrew (July 4, 2012). "Formula 1's greatest drivers. Number 12: Gilles Villeneuve". BBC Sport. Archived from the original on 2016-08-26. ^ "Racer dies of crash injuries". Boca Raton News. May 16, 1986. ^ "Elio de Angelis". ESPN UK. Archived from the original on 2015-07-13. ^ Benson, Andrew (April 21, 2004). "A death that shocked the world". BBC Sport. Archived from the original on 2010-11-24. ^ Harding, Thomas (June 27, 2000). "Driver 'died of heart attack before crash'". The Daily Telegraph. London. Archived from the original on 2018-02-14. ^ "Fritz Glatz". Grandprix.com. July 19, 2002. Archived from the original on 2018-10-21. ^ a b Pye, Marcus; Benyon, Jack (September 7, 2017). "French driver David Ferrer dies after Zandvoort Historic GP crash". Autosport. Archived from the original on 2018-10-12.